Bending beneath the invisible west-wind’s sighs." I saw so many different types of tulips at the Lewes Tulip Festival earlier in April that I wasn't sure which flower photo to share first. Then the Boston Marathon raced into the news this week and made my decision easy, as these gorgeous red and yellow tulips are named after the city. The coloring if the Boston tulip is so pretty! I wish we had gardens like this where I live. Your luck :-) I love flowers. Oh they are lovely! We're having a tulip show here in Singapore too.. These are great. My tulips didn't make it this year. Tulips are so beautiful. I love any kind of blooming bulbs. So glad you have color and spring up there! I love tulips! That's the perfect quote to share, too. Gorgeous! The tulips are still in bloom here, but they won't be much longer. I love spring!! So beautiful! My grama absolutely adored tulips! The tulips are beautiful! I love the coloring! The red and yellow are my favorite kind of tulips, but I never knew the name of them. Thanks! So pretty! 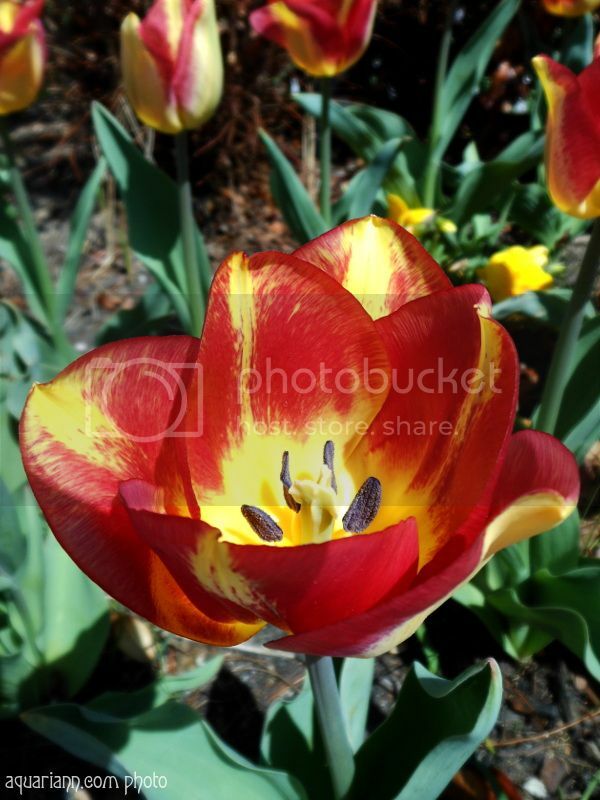 It is a gorgeous tulip and you photographed it beautifully. Beautifully captured, as usual! Tulips are definitely one of my favorites. Sure wish out tulips would pop already. Those looked great! So pretty. That lady who was complaining at the tulip festival surely most have missed this beauty. What a great shot!!!!! That is so pretty. Great close up shot. Very pretty. have you heard of the Skagit Valley Tulip Festival? I'm so lucky to live in the same state it's held in. :) I have so many pics I can use for future WW posts. What a stunning flower!! Love the red and yellow combo! I love flower shows, but I haven't been to one in a while. I've never been to one dedicated to a specific type of flower either, but tulips are divine. omg. this is just gorgeous. it also goes well with your sunburst treasury post from yesterday! I love tulips, I keep wishing I could plant them, but have desert landscape. Not sure how that would work. #39 WW still open.